China's central bank is restricting lending at some (though not all) banks. China's central bank is restricting lending at some (though not all) banks. -- This is a good thing! Don't we want China to prevent excess liquidity from contributing to another bubble? Of course, we do! President Obama has proposed outlawing banks that take deposits from engaging in proprietary trading -- So what? This means half a dozen "too big to fail" banks, the ones that took the global economy to the brink of destruction, will see their profits reduced. There are probably 1200 banks in the U.S. that will be totally unaffected by this proposal if it ever becomes law, which is doubtful, anyway. Some members of Congress have announced that they have withdrawn support for re-appointing Fed Chairman Ben Bernanke -- it's interesting that so many bloggers are calling for Bernanke's head but when that circumstance begins to seem possible, investors vote emphatically "No!" According to the administration and even some Republicans, though, Ben is still expected to win re-appointment. So this is probably a non-issue. Company forecasts are reasonably positive -- though many company management teams are still sounding notes of caution, nearly all are indicating the worst is over and many are looking forward to growth again. Unfortunately, few are talking about ramping up hiring at this point. Economic reports are mixed to good -- OK, not every regional survey or every industry is hitting on all cylinders but, except maybe for new home builders and certain auto makers, the general trend is positive. Certainly the employment situation is still troublesome at this time but continued economic improvement will in time lead to gains in employment. After a recession of the severity we have just experienced, you can't expect the recovery to be straight up in all industry sectors and all segments of the economy. My take is that we are seeing more of a technical move in stock prices rather than a situation where investors are shocked at a decline in fundamentals. To me this implies this pullback, though it might lead to the kind of 10% decline that is characterized as a correction, will not be especially deep nor particularly long in duration. So if this pullback is primarily technical in nature, let's examine some of the technical underpinnings of this market. The following charts are derived from data collected during our Alert HQ process and they provide a high-level look at a couple of the indicators we track across the whole market. For this first chart we count the number of stocks above various moving averages and count the number of moving average crossovers, as well. We scan roughly 7000 stocks and ETFs each weekend and plot the results against a chart of the SPDR S&P 500 ETF (SPY). You can see that yellow line that tracks the number of stocks above their 50-DMA has plunged below the magenta line that tracks the number of cross-overs. This kind of action is generally followed by further weakness until the magenta line traces out a more distinct decline. This suggests investors could be in for more pain. This chart shows a nasty situation developing. The number of stocks in downtrends (the red line) was about as low as it has been in the last two years. It's no surprise then, that the direction of least resistance for this indicator is up. Similarly, the number of stocks in up-trends had reached a high level, though not an extreme level, so it is not shocking to see the indicator drop. You can see that the ETF has already fallen through two support levels as designated by the blue and green horizontal lines. 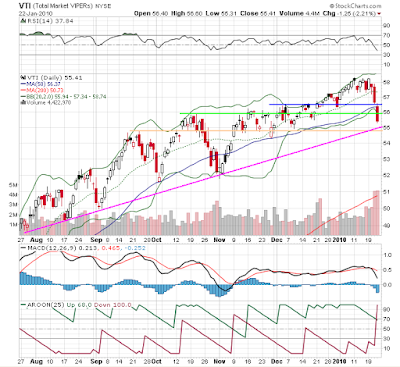 VTI has also fallen below its lower Bollinger Band and its 50-day moving average. MACD has broken in a bearish direction and Aroon has, too. All told, the damage has been pretty severe and it has occurred in quite a short time. You can also see that we are pretty close to the next support level (the orange horizontal line) and the trend line (the magenta line). A move below where these two lines intersect, in the $55 area, could easily see the ETF fall to the $51 to $52 range. And that would give us a full-blown correction. Technical analysis suggests this market has further to fall though we could easily see a little bounce early this week. On the other hand, the fundamentals still support a bullish outlook. So, while Mr. Market works his way through this pullback, it is prudent for investors to just step aside or run for cover. On the other hand, I would NOT short this market. In my opinion, given that the long-term trend in stock prices and fundamentals are both positive, the best idea is to keep some powder dry. The BUY signals could be back next week!